Triggers are actually more like events and therefore won’t fire for changes that were committed prior to the point the trigger was created or enabled. As you can see, it’s relatively easy for teams to get into a situation where their builds don’t trigger, but they can’t immediately see why. In these situations the only options really are to queue up a build manually, or wait for a future change to fire the trigger. Given this, I’ve started checking pending changes after activating a build’s triggers again to see if I need to manually kick off a build to avoid confusion. 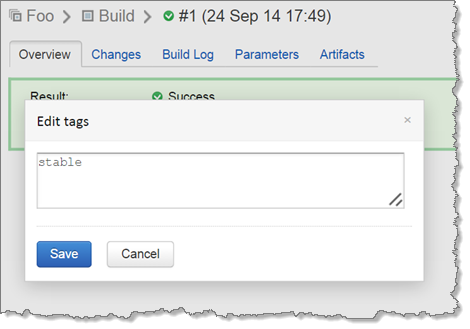 A key feature of TeamCity is the ability to define properties in a build. TeamCity implements a form of inheritance for properties. If you add a dependency to another build, you can reference properties on the referenced build just as if they belong to the build you’re configuring. This is extremely handy when you’re implementing any sort of pipeline as you can allow the source build (i.e. the build which triggered a build chain etc) to define a set of properties and then simply re-use these properties throughout your subsequent builds. Lets ignore the fact that these would probably be better placed in a template which your configuration implemented. Whilst good practise, it’s not all that relevant for this example. I realise this isn’t an entirely realistic scenario, but not outside of the realms of possibility. For reference; a better solution is to have the developers use the “Promote” functionality to promote the build they’d like to the deployment build configuration. This happens because TeamCity doesn’t understand how to resolve the property you’ve referenced so assumes you want to define it in this build! This is actually a very handy feature of TeamCity that means you can define all your build steps without having to think about all your properties first, but in this instance it just confuses things. So what’s going on? Well, despite properties being defined on build templates/configurations, as far as dependencies are concerned properties actually exist on builds themselves (as in, a “run” of a build configuration). In our fictitious scenario, there aren’t actually any builds with the “stable” tag, so it doesn’t have anything to interrogate to work out which properties are available. Everything is good in the world! When I first encountered this, I was utterly stumped as to why my properties weren’t showing up. It took a long time and many hours of frustration to work this behaviour out. I was so convinced that this wasn’t intentional that I raised a bug with JetBrains. The response was that this was “by design”. Obviously this is JetBrains’ prerogative, but – in my opinion – it doesn’t make a whole lot of sense. I understand that properties aren’t all defined in the build configuration or template itself and that some are only actually present once you run a build, but it seems like at least displaying the list of properties which are defined for the user to select would have been a half-way-house and avoid this confusion.